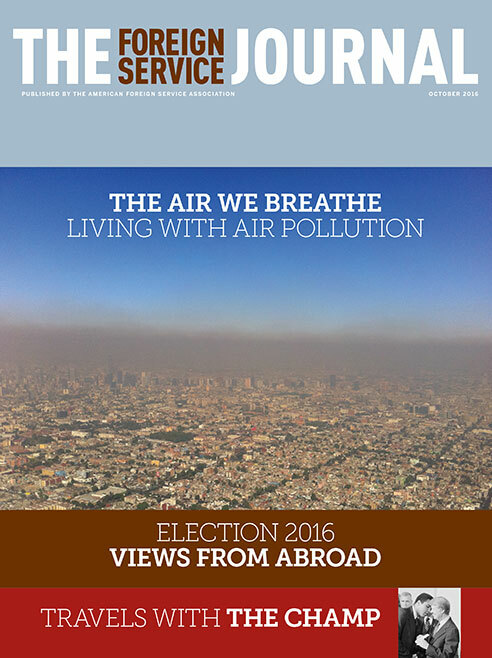 The October issue covers living with air pollution and focuses on the U.S. election through a foreign lens. Many Foreign Service families spend a significant portion of their lives assigned to cities with unsafe air. What are the effects, and what can be done about it? Pollution can lead to serious health issues, and dealing with that can be a bureaucratic nightmare. The contest between two colorful personalities has drawn unprecedented attention and some concern here, but there is little fear of changes in the bilateral agenda. Donald Trump might be uniquely American in his demeanor and rhetoric, but to Austrians the factors behind his startling success are not. The old formula for evaluating the U.S. presidential contest has given way to complexities. Though it is not the first U.S. election that has really mattered to Mexico, there may be more at stake this time than ever before. The problem of undocumented U.S. kids in Mexico is a facet of the immigration tangle that is putting pressure on both sides of the border.